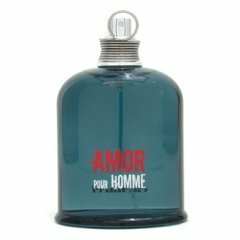 Amor pour Homme (Eau de Toilette) is a perfume by Cacharel for men and was released in 2006. The scent is woody-floral. The production was apparently discontinued. I rather like this fragrance, so much so that I'm keen to wear it myself. When I first sprayed Amor pour Homme it reminded me of my Mother's Italian cooking spices, it had a very herbaceous quality. The more it settled, I could sense the element of freshness and sweet masculinity. At times this fragrance oozes a clean soapiness which is highlighted by some juicy citrus and rich spices. Although very masculine, I can't help enjoying this fragrance on my skin. It's such an unexpected surprise. Once this fragrance reaches the drydown, I could smell this absolutely delicious blend of thick resins, smokey woods and exotic spices. I am so very impressed with Cacharel for composing one hell of a male fragrance. It seems that the female equivalent, Amor Amor has gained much more notoriety than Amor pour Homme, which is a shame because they are both great scents that should be equal. I rarely see this fragrance in the stores, and I only managed to find this fragrance by stealing a sample which had been hidden behind a price list sign. Write the first Review for Amor pour Homme (Eau de Toilette)!